I am amazed that I have posted 200 times. This is so unexpected of me. Last February in the cold, I would never have imagined that writing was so much fun. I did wonder how could I fit this in with my already hectic life. I still wonder that. But regardless, I am hooked. To celebrate my 200 posts, I want to give you something. This is not some give away where I review a product and then make you jump through hoops to win. I am just giving away the best book hands down. I have a Bible to give away. Because I appreciate the fact that we all have a free will and the ability to choose, I want you to choose which Bible you want to win. 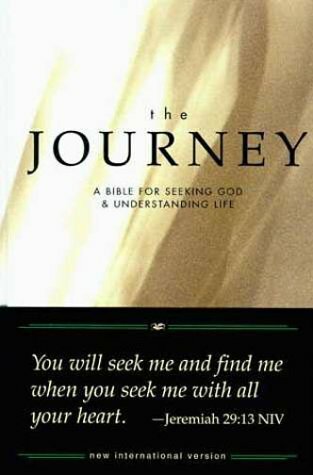 The Journey a Bible for Seeking God and Understanding Life. This Bible is a hardcover NIV. It has slight water damage, but nothing too bad. This won't be noticeable after your first few months of reading it. It is full of excellent Bible helps and I think it would be a great Bible for teens or as a gift to an unbeliever. A slimline red leather bible with a magnetic clasp. I love the red leather. I love red. I have accepted that my eyes are not as young as they used to be. Also, I look terrible in glasses. Now, I am addicted to large print Bibles. I need the Word to jump out at me. This stylish little Bible is the Bible to keep in your purse. It is the NIV by Zondervan. There you have it! The best book in the world to win. All you need to do is leave me a comment with one of your favorite scriptures. But you can't steal Paperboy's. "Jesus wept." That one is reserved for the boy who is allergic to pencils. Someday, I will share with you his creative writing avoidance tactics. I'll share a scripture that encouraged me greatly at the beginning of my homeschooling journey. My translation of these words "I NEED JESUS!" I will pick a winner from the comments in a few days. Please leave a way for me to contact, an email, twitter or blogger id. "The next day, John say Jesus coming toward him and said, 'Look, the Lamb of God, who takes away the sins of the world!'" This is God's Word on the subject: "As soon as Babylon's seventy years are up and not a day before, I'll show up and take care of you as I promised and bring you back home. I know what I'm doing. I have it all planned out—plans to take care of you, not abandon you, plans to give you the future you hope for. "When you call on me, when you come and pray to me, I'll listen. "When you come looking for me, you'll find me. "Yes, when you get serious about finding me and want it more than anything else, I'll make sure you won't be disappointed." God's Decree. "I'll turn things around for you. I'll bring you back from all the countries into which I drove you"—God's Decree—"bring you home to the place from which I sent you off into exile. You can count on it." I'd love to win the Journey and if I do, I have an address in the US where you can send it to. Thanks! Happy 200th! :) My favorite- Ps.34:4 I sought the Lord and He answered me and delivered me from all of my fears. I recently purchased a large print Bible for myself, too. Either of these would be great gifts. Delighted to meet you! (especially on your anniversary and a fellow homeschoolin momma) Hope you don't mind if I splash around to get to know you a bit. This looks like a refreshing place to dip and get drenched in goodness. One of my favorite verses is Hebrews 11:1. It speaks of faith and what it means. A good scripture to help people who do not understand it.